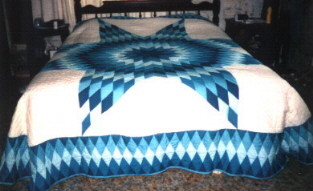 This is a Queen sized hand made quilt...my first effort. It is done from the Bethlehem star pattern in shades of aqua. The background color is an off white with tiny aqua designs in it that do not show up in the scanned picture. The quilting pattern between the star points is FEATHER RING, with diamond shaped rows of quilting throughout. The star sections are all quilted on both sides of each piece. The border starts with a row of half diamond shapes make an even row, with diamond shapes the same colors as the star throughout. This decorative border allows the quilt to be any size one likes.. from double to queen to king. The hem is merely a bias of one of the aqua colors within the quilt. Click on picture to see pattern. 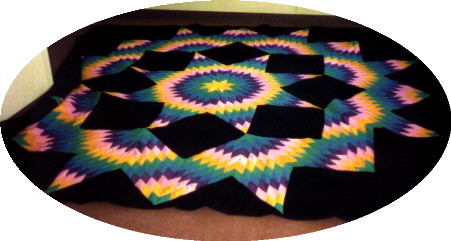 This is a "lap robe" sized quilt done for my aunt who lives in Phoenix, Arizona. 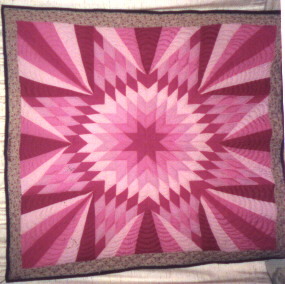 Her favorite colors are pinks, so the quilt was done in shades of pink, with the colors flaring out from between the star points instead of the traditional blocks. The quilt was all pieced and quilted by hand. The pattern for the "rays" that flare out from between the star points was made by taking a full sized paper template of the square pieces that would have gone in those spots, then folding that template diagonally from the bottom point that fits between the star points until the desired number and size of flare sections are acquired, then cutting that into the pattern. You must then remember to add the 1/4" seam allowance when the pieces are cut out so that it will fit when sewn together. The quilting pattern is CLAMSHELL, easily drawn on the fabric with an Invisible Ink pen, using a plastic margarine container lid for the pattern. The larger circles between the star points required larger sized lids. The largest used was from a 5 gallon ice cream container. This quilt was made for my son. My intention was to use the Amish look of the bold solid colors while making those colors suitable for a man. The Broken Star pattern was chosen to add interest to the remainder of the queen size quilt without adding feminine or feathery quilting. The colors for the star were chosen based on the rainbow.. adding a link to the colors of the universe. The quilting was done with threads that matched each section that was quilted, and the black thread on the black fabric was very hard to see to sew. The quilting pattern was of six pointed stars within the spaces between the center star and the "broken" edge pieces, then with the parallel rows of stitching to make diamond shapes from the outer star points to the edge.